What really excites us most about the winters are the festivities and excitement that blankets us. Christmas is already here and people across the world are gearing up for the merry celebration, followed by the big bashing night of New Year’s eve. What makes the celebration of Christmas even more special is the pure joy of gorging on different types of delectable treats on this day. When it comes to indulging yourself in the happiness of delectable Christmas treat, your dessert chart would go incomplete without the Christmas special plum cake. 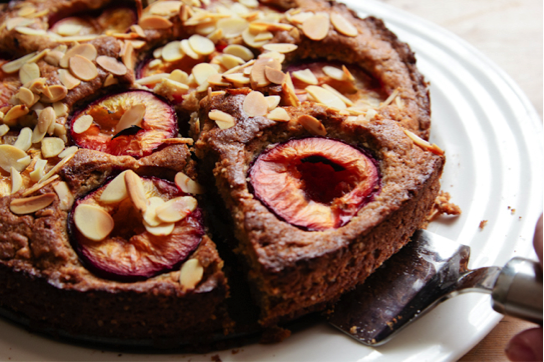 The special fact about the Plum cake is that the people begin the preparation of plum cakes months prior to cooking it. Now, you might be wondering to know -what exactly causes the slightly bitter taste and dense texture of the plum cake? It’s because of the dry fruits that are soaked in rum or brandy for months. The aroma of the Christmas plum cake, with its aroma infused dry fruits and nuts, is simply intoxicating and irresistible. The fruits used in Christmas special plum cakes are either dry fruits like grapes, currants, raisins or prunes or fresh fruits depending on one’s taste and preferences along with plum as the vital ingredient. The first thing you need to do is stir together dried fruits, candied ginger, candied orange and brandy and keep it for overnight. Pre-heat the oven to 180 degree C. Butter two 9/5 inch loaf teens and at the same time, line them with the butter paper. Take a separated bowl and mix all the dry ingredients- flour, baking powder, salt and spices. Use a mixer to beat the butter and both the sugar until you find the smooth mixture. Add eggs one by one followed by the Molasses and Vanilla. Add the flour mixture in a slow but steady manner and mix it till it gets completely smooth and then add the fruit mixture and walnuts. Divide the entire batter between two tins. Bake for at least 1 hour and 35 minutes till the tester comes out of the cake clean. Now take the cake out of the oven and brush the top of the cake with liquor. Heat thee jam and water until it gets smooth and brush the top of the warmed cake. Now, you might have gotten the whole idea about making a super sumptuous plum cake and now it’s time to add vibrant color to the festivity of Christmas.